There are so many times that we wonder why this guy doesn’t have a CD out to go with all of his great performances. We see them locally and wish we could take something home. Such is the case for bassist John Dillard. He has been the bass player for so many A list players who come to town. No matter who is here, you can almost always count on John to be there to throw down the bottom line. His premier release called Let’s Ride is highly anticipated and show cases the talents of several more artists. Each song stands on it’s own as they are themed towards the title. He kicks it off with an excellent intro featuring both Lin Rountree on trumpet and trombonist Buff Dillard called “Funk This.” The spoken word by Quentin Talley takes it up a notch and gets the whole thing going. 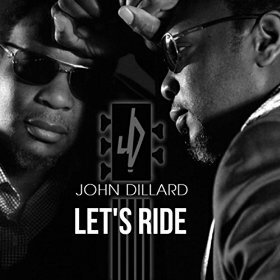 It acts as a catalyst for the title track as Dillard stretches it out and shows what he can do. With a nice tempo in check Marcus Anderson adds in some licks on sax to take it to the end. “Gotta Make This Right” picks it right back up and has you clapping along in no time at all. The bass line is more melodic here and presents the hook early. Art Sherrod, Jr. shines on sax. “Cruise Control” slows it down slightly as the pace is set deliberately as the name implies. Anderson makes his presence known with some really great work here before handing the controls back over to Dillard once more. I think you’ll back up and take this ride again. “26 East” slows it down considerably for more introspective look that features some nice acoustic guitar work from Reggie Graves. It leads right in to “I Need You” as Dillard shares the billing with keyboardist Chad Lawson. You get to hear much more of the bass here. He picks it up once again for “Window Seat” as we all sit down to view what’s going past us. I really like what John adds on keys here as a haunting background to the melody of the bass. Gabriel Bello lays down a nice sax solo that leads back to Dillard’s keys and bass. Nicely done. “Turbulent” is anything but, as it moves along at a medium pace backed by the guitar of our good friend Matt Marshak. Lovell Bradford’s Rhodes gives it a “Bob James” feel as they take it to a good ending. He picks it back up with the head bobbing “Forward.” This one has John out front the whole time as he takes the lead and never lets up. Oli Silk is on board for the keys here and the two play off of each other very well. If you love bass as much as I do, then I’m sure you’ll want to take a ride with John Dillard soon. This local native has brought in a great listing of “friends” to be with him on his first journey. Be sure to check it out soon and enjoy something new of all original material. You will be glad you did.